There is something definitely immeasurable about creativity, one of God's gifts to humankind. This is especially true during Christmas time. I am sure we all have been amazed and stood in wonderment at one time or another at some one's creative work and asked just how did that person or persons ever think of such an idea. The limitless boundaries of creativity can be endless, unconfined, universal and ever changing which allows for the magic and simplistic joy of such creativity to be enjoyed, not just for one's self, but for everyone, particularly during the holiday season. And yet, this week, my imaginative direction has taken me to an entirely different place. One of nature known for peace and tranquility......that is, the wooded forest. Just as Fall quickly turns to Winter, one's inspiration and fancy can change from playfulness and whimsy to humility and meaningfulness. I hope you will enjoy your Christmas "walk through the silent woods" among forest friends complete with pine branches, birch bark, pine cones, antlers, vines, forest animals and snow as part of my Christmas Tablescape Blog Hop contribution which was organized by Ms. Chloe Crabtree at Celebrate and Decorate. Take pleasure in the quiet and sacredness of the tranquil winter solace where the solitude, calm and contentment overcomes your every senses. Where one can reflect on the words, "Peace on Earth" and their true holiday meaning for each of us. 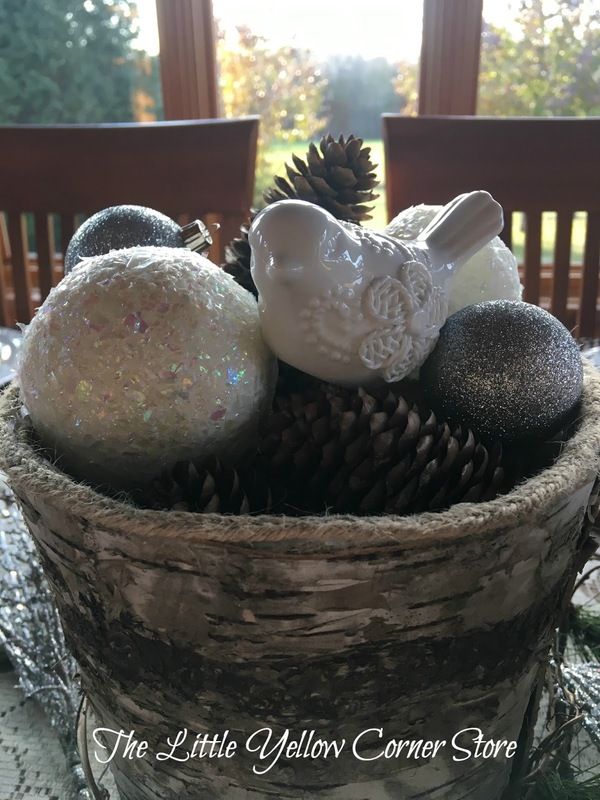 Be sure to visit the other wonderful Christmas blogs listed below for some exquisite holiday ideas from some very talented participants. 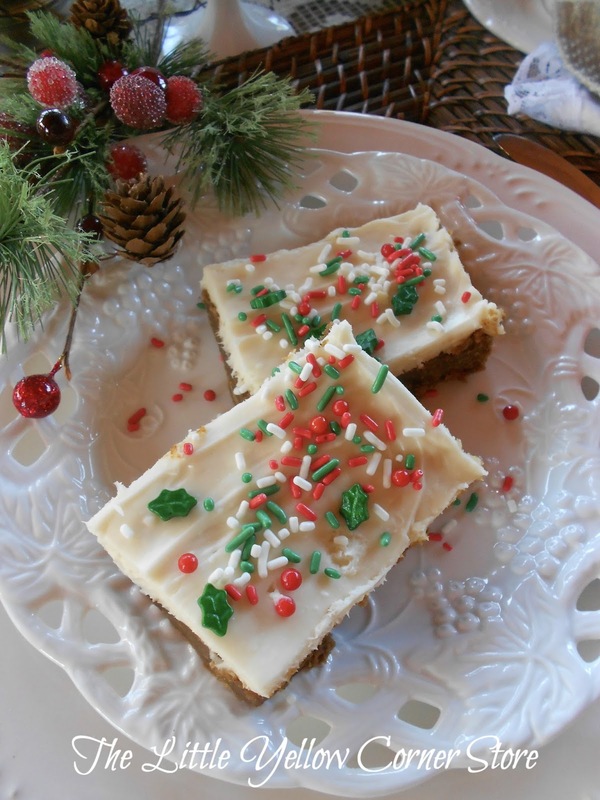 Also pictured are some soft and chewy Christmas Cream Cheese Gingerbread Bars. I found this delightful recipe on Pinterest. It just wouldn't be Christmas without some kind of gingerbread and these bars are fast and easy to make and a change from the crunchy gingerbread cookie. 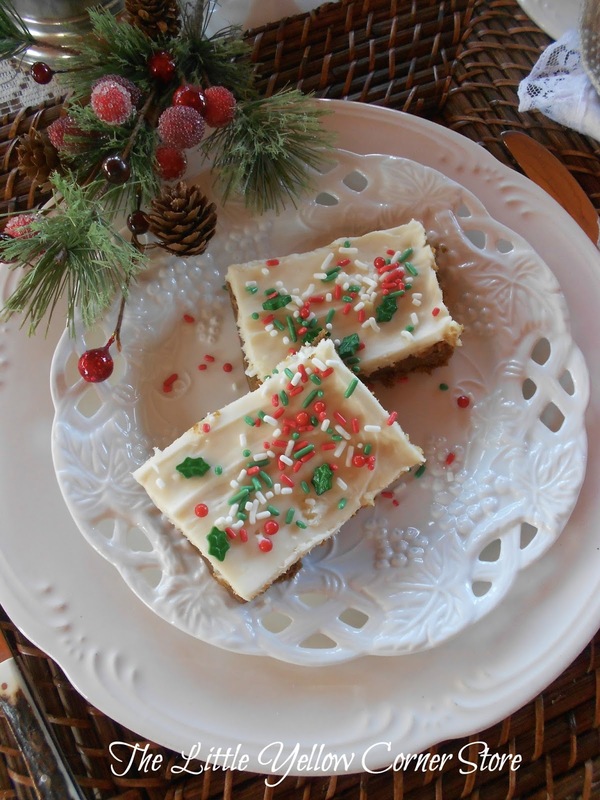 You can find the recipe at Chewy Gingerbread Bars With Cream Cheese Frosting. Many of God's blessings to you and your family at Christmas from The Little Yellow Corner Store. I did enjoy the walk through the silent woods! 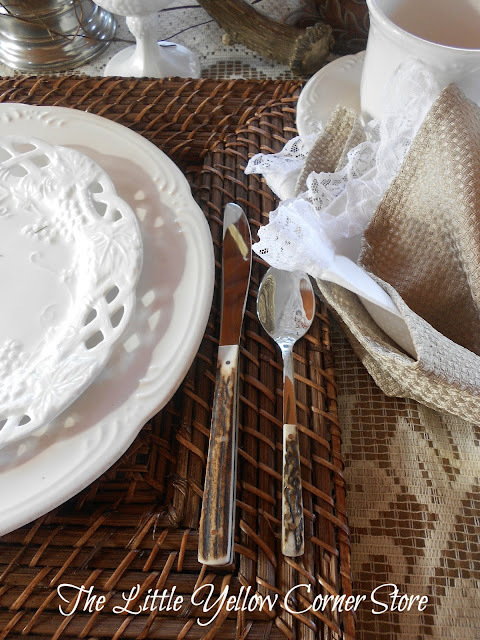 Your dining table looks wonderful and I love those beatiful white plates- they are exquisitely detailed. Love all the details you put into this. 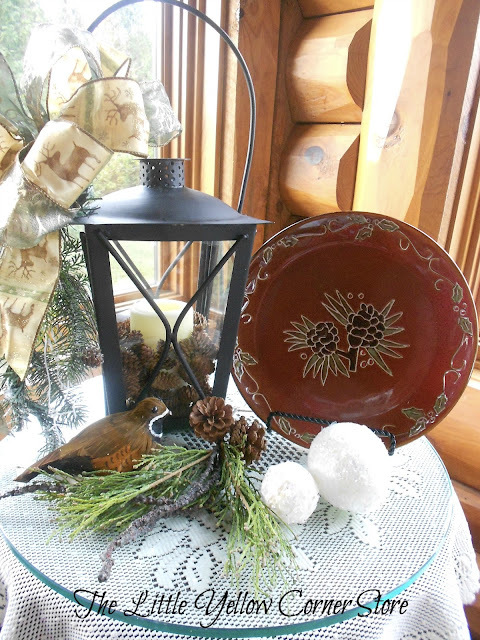 I’m working on my mantel which will have pine cones. I think since we live in similar environments we are drawn to the woodland accents. Wishing you a blessed season! 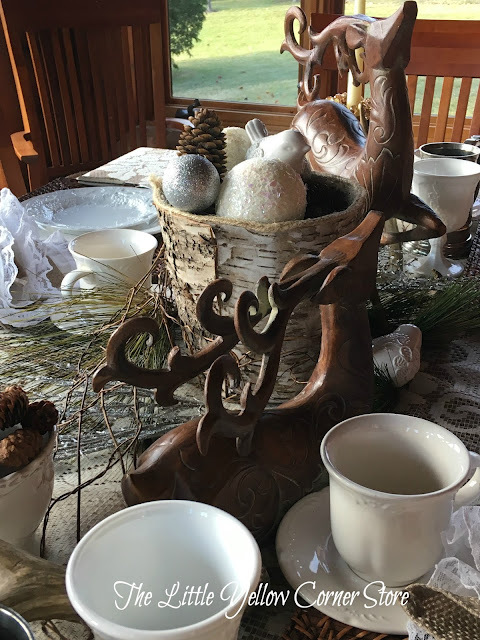 I enjoyed my walk through the silent woods and all your pretty and tranquil details of your table from your wonderful deer, birch bark container, snowy white lacy tablecloth and beautiful plates! 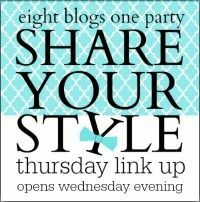 It's always a pleasure to blog hop with you! Wishing you peace and joy this Christmas season. Marsha, you've captured the serenity of nature in winter perfectly on your table, but your words are very meaningful too. The pierced plates are just beautiful, and the gingerbread recipe looks delish. Thanks for sharing! I am crazy for those lacy white plates!! Such a pretty table, so serene in the neutrals. 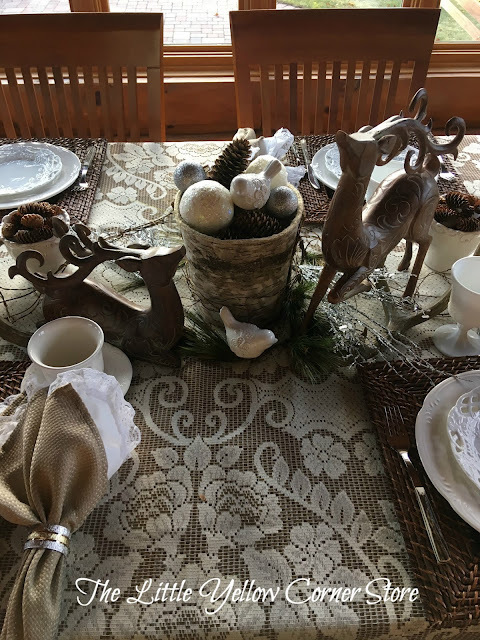 What a wonderful and relaxing tablescape Marsha. I enjoyed my walk through the woods with you. Very calming and peaceful. 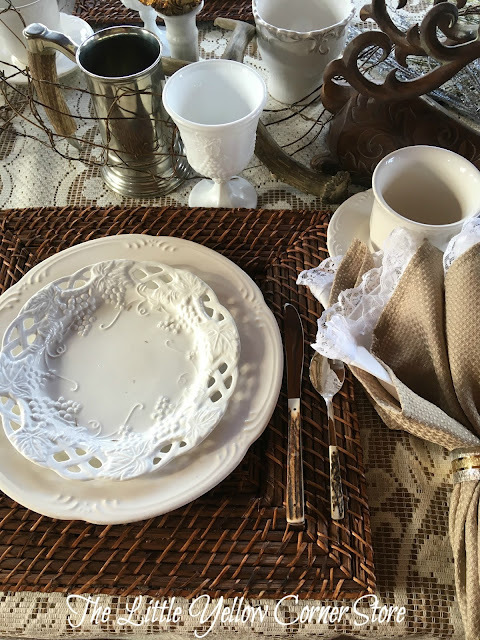 I loved the juxtaposition of the burlap and lace napkins along with your white pierced plates. Thank you for slowing me down a bit. Merry Christmas! Thank you for the silent walk in the woods with your forest friends. 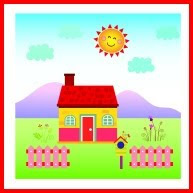 You have created a peaceful setting with lovely details. The pierced plates are beautiful. Your sentiments are sweet and perfect. I always enjoy blog hopping with you. Wishing you the joy of Christmas! Nature-themed tables are so dear to my heart, and I love how you have recreated a walk in the woods, with so many details to savor. Brilliant! I love the quiet tranquility of your setting! It reminds me of the quiet just after a night snow has fallen. I love the whimsy of your snowballs in your last image! It's sweet, delicate and peaceful. Beautiful job! I absolutely love your reindeer. They are the perfect center piece for your table. Thank you for sharing your holiday table as part of this fun blog hop! First of all, I love your dining room with its big windows and natural light. 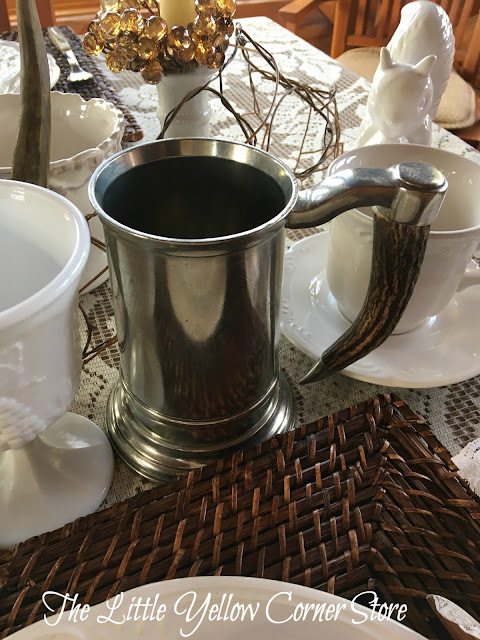 The pieces on your table add so much interest and character. It's a very warm and cozy setting. What a lovely place for a Christmas celebration. 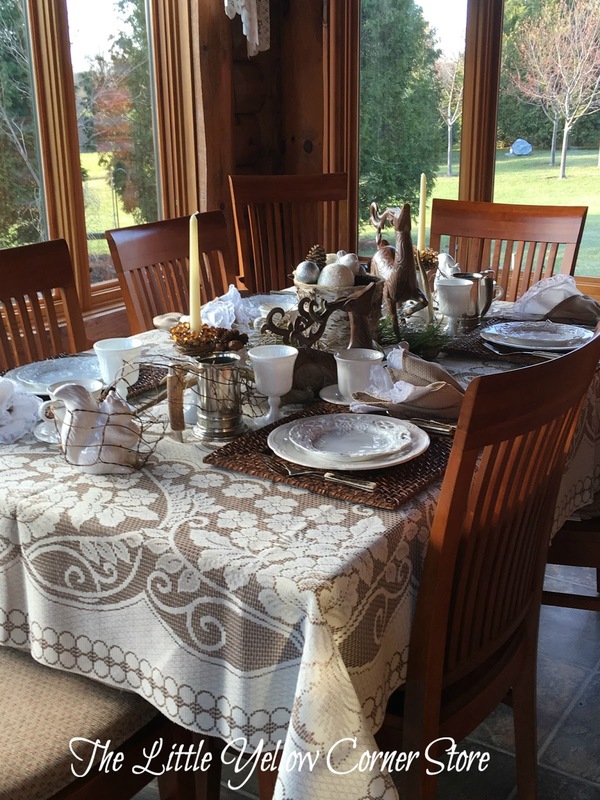 You've captured the essence of your theme perfectly with this lovely tablescape. Viewing the details, I instantly felt calmer and more relaxed... exactly like a silent walk in the woods would make you feel. Those white plates with the cut-outs are breathtaking and the designs on the deer seem t coordinate wonderfully with them. The birch bark vase, the squirrel and the cute white bird all speak of nature. Those squares not only look delicious, they look pretty on that plate with the greenery & berries beside them - great photo! Really enjoyed my stop here on the Blog Hop! 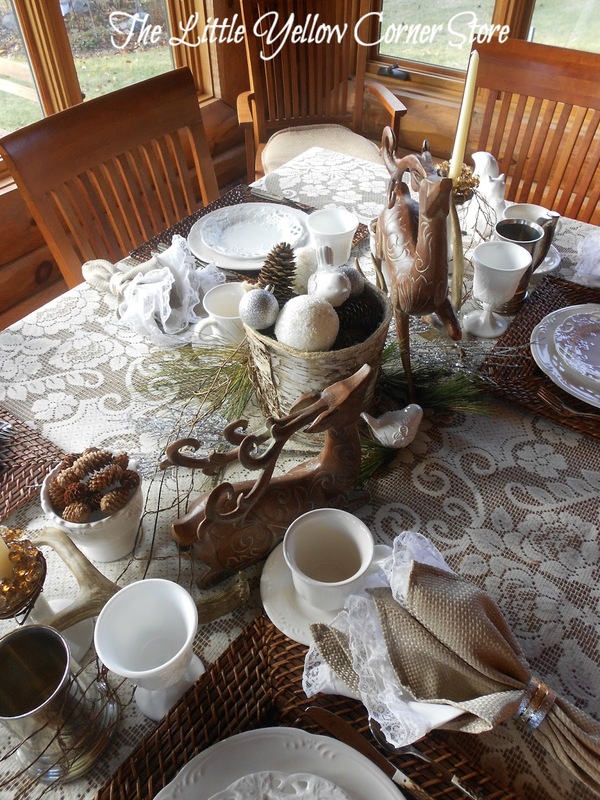 Such a enchanting Christmas tablescape! It make me dream about a silent forest where all creatures paecefully share season's sentiment of fraternity and joy. Love it! Nicely done! The white throughout gives it a contemporary woodsy feel! What a beautiful tribute to nature. This time of year we spend loads of time walking through the woods enjoying the wildlife and all that Mother Nature as to offer. 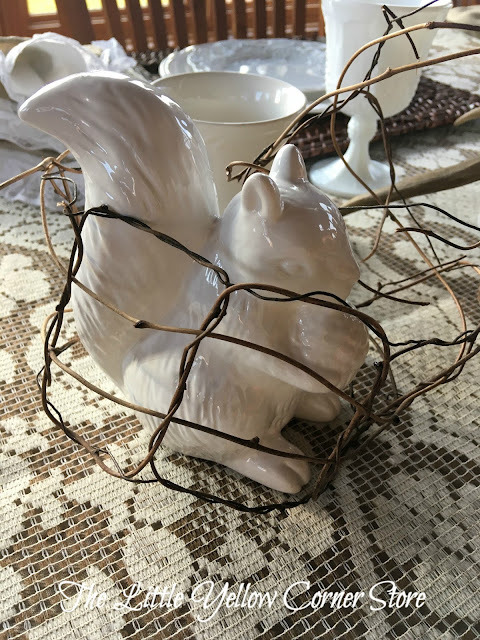 You have really brought it to life in your table décor. The reindeer and beautiful. What a pretty table setting! You nailed the ambiance. It truly felt woodsy and wintery. Very pretty! Oh, I need to borrow your table and put it next to my Christmas tree, they would go perfectly together!! 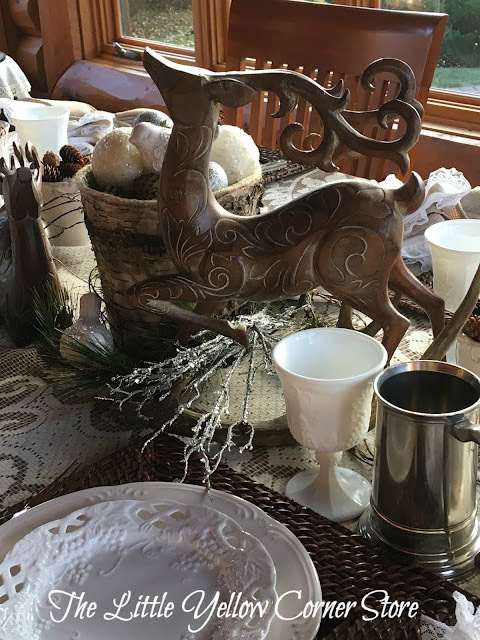 I love all the natural elements and different textures you used creating the perfect winter wonderland table!! It's beautiful!!! 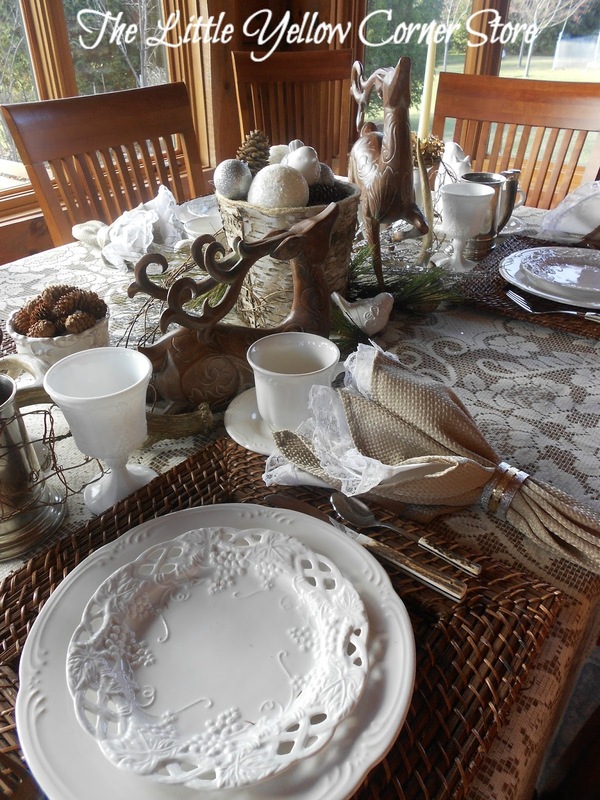 I love your tablescape with the reindeers and your beautiful dishes. I noticed your beautiful silverware, which fits right in with a walk through the woods and all your animals. So glad meeting you from the blog hop! What a wonderfully whimsical tables cape! I love your white plates and all of the natural colors and details. I happened on your blog from the Ravenwould Wednesday link. Nice to meet you! 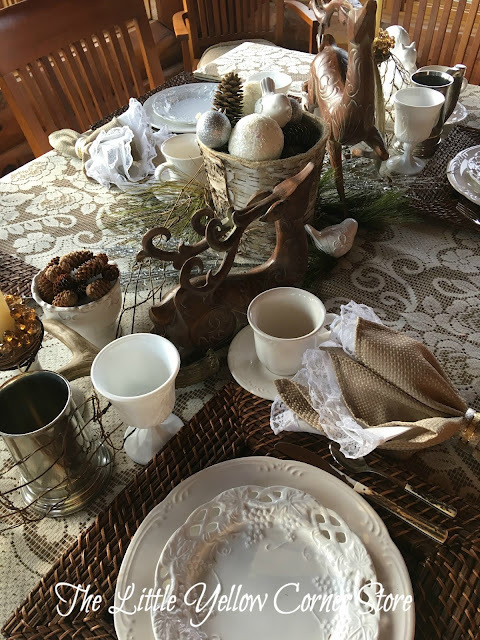 What a gorgeous and elegant holiday table! Your white china and tablecloth are such a beautiful pairing! It has been so much fun blog hopping with you! Loved the walk through the woods. It was exactly what I needed. Those white plates are so gorgeous. The reindeer are a perfect addition. A calm and natural table to sit down and take in Mother nature's elements. 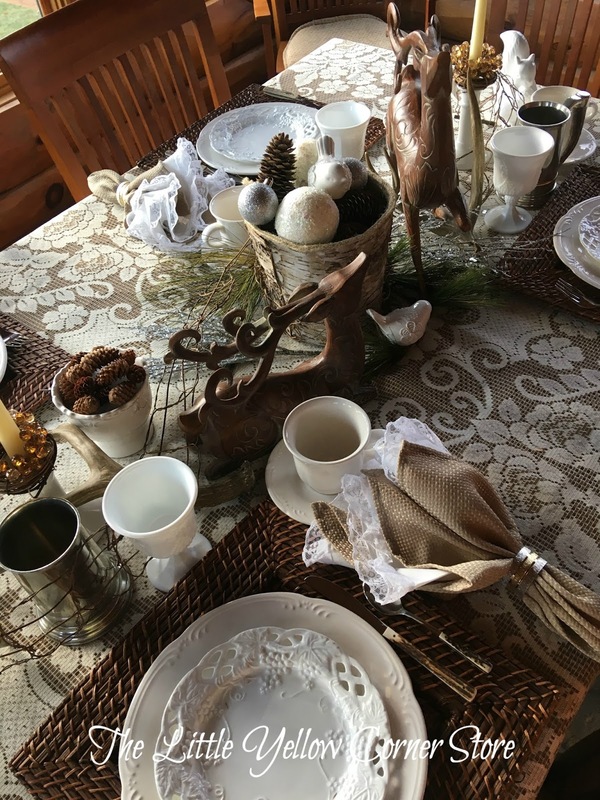 So happy to be part of this tablescape blog hop. 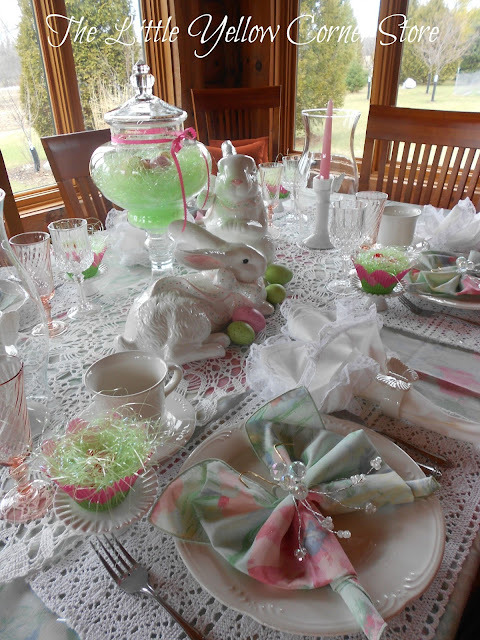 Marsha, what a lovely and serene tablesetting. And your dining room is just lovely...it invites nature in. This is beautiful and the view is amazing. It was a pleasure blog hopping with you and thanks for sharing at Celebrate Your Story. 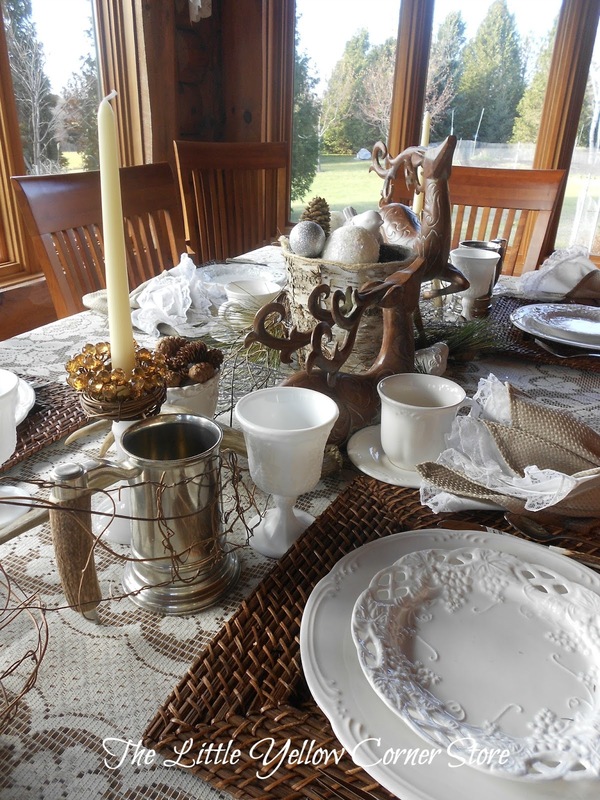 So lovely to see a more neutral and calming tablescape. The table is very pretty and feels relaxing and almost purifying compared to all the glitter, lights, and business of the holidays! 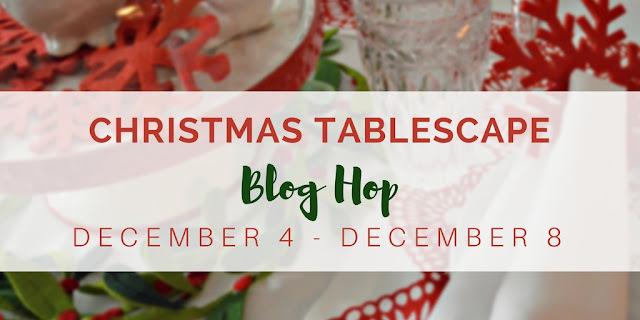 Thank you very much for being part of the Christmas tablescape blog hop. Your Forest Friends AT Christmas is a great theme for your beautiful tablescape. Hope you have a great week and thanks so much for sharing with us at Full Plate Thursday. This is such a sweet and lovely tablescape. I enjoy the soft and serene color palette and the incredible view from your dining room compliment your theme beautifully. 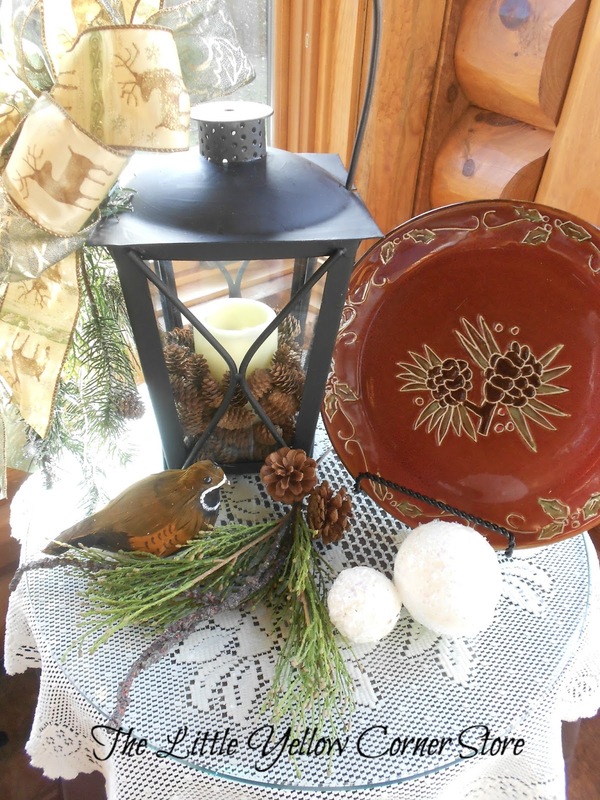 So enjoyed joining you on this Christmas Tablescape Blog Hop! Happy holidays. Looks lovely and crisp! Happy holidays! I've enjoyed touring with you. 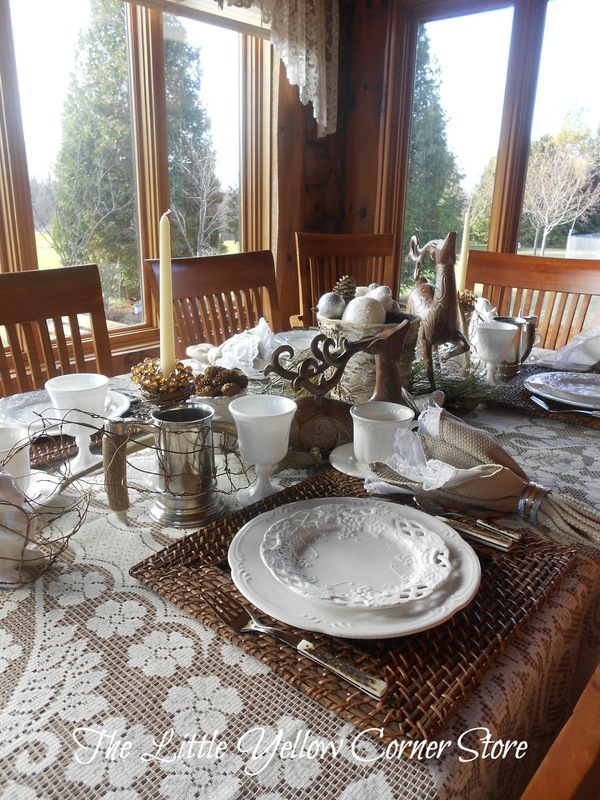 Your Tablescape is featured on Full Plate Thursday this week. Enjoy your new Red Plate and thanks so much for sharing with us.